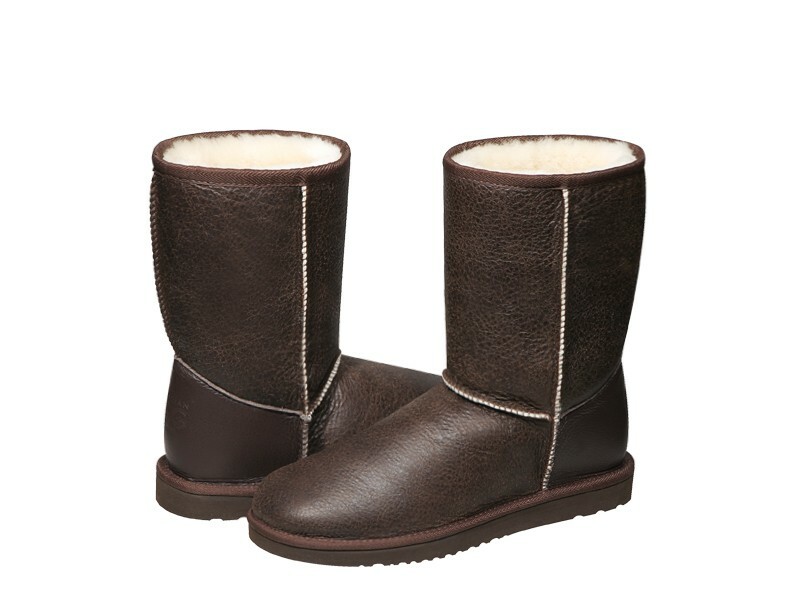 Original Australian Nappa Short ugg boots made in Australia from genuine Australian double faced sheepskin. Buy online here, select required options, add to cart, proceed to our secure checkout and pay with PayPal, credit card, debit card OR buy at our SYDNEY FACTORY OUTLET where you can get FREE pair with BUY 3 GET 1 FREE special offer and save up to $200 or get $10 cash discount for each pair paid by cash. I was so excited when I saw the boxes and I put them on immediately they are suuuuuper comfortable its like walking on air :))) I love genuine Australian sheepskin boots !!! I couldn't believe how fast I received my new uggs! I ordered two pairs of amazing Nappa boots! Will be ordering from them again! This is my first purchase from originalaustralianugg.com and I couldn't be happier. The online purchase was simple, notifications immediate and delivery quick. My nappa ugg was exactly as advertised. Really impressed with the quality and communication throughout the process. Order arrived when they said it would. Fully satisfied!I'd recommend this site to anyone. Brilliant! This is my first ever online shopping experience, I am very impressed! Fantastic quality very easy ordering process and polite service! Recommend! I will definitely buy from these guys again! Excellent shopping experience, excellent quality, excellent shipping time! Really luxurious. They are really adorable too. I would definitely buy again. The boots were exactly boots 1st rate! and as advertised and just what i needed. Wanted a comfy pair of short uggs for my 10 year old son and these nappa boots fit great. The price was great and quick delivery a great bonus. Will definitely order again and recommended to friends! Thanks for the super easy transaction. Love the boots, size is perfect, shipping to France cheap and easy. I'll be coming back! AUSTRALIAN UGG is clearly good choice, with perfect made and stylish product. They know their customer and show that respect throughout the purchase process - from product presentation to the clear messaging before delivery and, of course, the beautifully packaged goods. I was thrilled to discover a difficult-to-find WELL MADE UGGS on this site. If you want to access perfect quality and great style, this is the site to shop! My new favourite! I got these as my feet are always frozen in winter. I have had them a year now and still love them and there super comfy. The best value for money! I was very impressed with the quality of boots I received, but there was a size problem .. but service was great. They resolved the matter. I bought these as a present for my partner having enjoyed wearing your brand for years. Great Nappa Short did not disappoint. i would reccomend this company for great quality! I had previously made the order with another online store which cancelled the order 2 days after it was placed due to a stock error. I tried australian ugg original and found they had what I wanted so placed the order with them. I am 100% satisfied with my uggs ! Great quality! This is my 5th pair of ugg boots, but the first I bought from this site. Of all my uggs, these are the cheapest I've paid but the quality of these is better than my others. From the leather used, to the rubber sole and the internal lining....it's super comfy. I will definitely be buying all my uggs from here from now on. Hassle free purchase and quick delivery. You'll wear them all the time. Ive had mine for a year and they still look brand new.They are super durable and the water proofing spray actually works! Never used this web site before but would use it again and again. - Uggs are perfect, Delivery is fast, Price is affordable and Communication between company and customer is good! Excellent product..excellent service..i will buy from here again..thank you. I just received my first nappa boots, I just want to say good job Australian ugg original l'm very happy thanks so much. From Chicago Illinois. USA. Great boots and great service thanks Australian ugg original. shopping with you was great and wonderful experience: fast and easily trackable delivery. very satisfied and highly recommend! Super comfy, good looking, good reasonably priced. I already got some compliments here in Poland )))) Thank you for great boots and for great shopping experience!! I am absolutely satisfied with this company.The shipping was quick, service was friendly and helpfuI I would recommend you to anyone. Thank you. one of the most comfortable things I've ever put my feet in! When I first put them on, they felt a little tight where the seam goes up and across the top of your ankle. After a few days, it goes away. Love these! This is a great pair of boots! They are attractive and comfortable! Many people have offered nice compliments about these UGG boots when I've worn them. I am absolutely satisfied and pleased with the service I received from AUSTRALIANUGGORIGINAL.NET.AU. Thank you for your service, quality of merchandise and pleasing price. I am so happy with these boots. I had a different cheaper brand but love these so much more. I specifically love the black colour in the short. They go with everything. Very happy with purchase! Bought these uggs for my daughter. She absolutely loves them. Thanks for the great online shopping experience! Ordering is great - easy and painless. met my expectation and more! five stars! The boots arrived so quickly! I'm a woman with wide feet and I wanted something warm and cozy for dog walking and these are perfect! travelled to Sydney and found this ugg store and boots are ultra comfortable, with and without socks. they are look great with everything - one of the best purchases I've made. I am finally an new uggs owner! Searched for the best "quality-price" online and found it on your website. Beautiful, comfortable love these boots, they came as advertised nicely packaged.